IP Webcam is a free app which can convert android camera in to webcam. You can download it for free from the official Google Play. This Android webcam app has the intense capacity to convert your mobile into a wireless or USB camera having numbers of other functions. The application use your phone as a webcam by using a WiFi network or you can use it with your phone data cable. Works with Window, Linux and Mac. Download IP Webcam Android App. Also install IP Webcam Adapter on the connected computer. This adapter will be used to detect the Android phone as a webcam. Once the app installs, make sure the Android device is connected to your WiFi network, open the app up and check the settings. Having done all that, scroll down to the bottom of the app and tap on the option Start server. In computer open any browser or VLC media play and enter the IP address which is shown on mobile and check if you are getting the input from the phone camera. 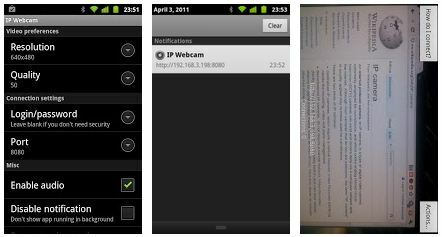 DroidCam is a android webcam application that allows you to turn your Android phone into a wireless/wired webcam through your home WiFi network or usb data cable. There is the DroidCam Android application you can install from the Android Market and a small plugin to install on your desktop computer. Now after you have installed on both devices just connect it up using Bluetooth or USB connectivity and follow instructions and you will be live streaming your mobile camera video as PC webcam.